Just when you thought you were sick and tired of Angry Birds news (I certainly was), Rovio Mobile has unveiled an intriguing new spin on the classic throw-the-birds-at-the-pigs gameplay, and it involves the much-ballyhooed NFC chip found in the Nexus S.
It's not available just yet, but it appears that in future releases of Angry Birds, you'll be able to utilize a previously Nokia-exclusive feature called "Magic." Simply bump your phone against a friend's to unlock new levels or share existing gameplay elements. Better yet, Magic will work with your phone's GPS chip so that when you travel to a real-world location and touch your phone to an NFC tag, new gameplay features will be unlocked. 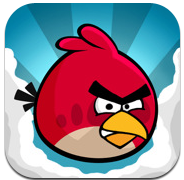 In an interview with GigaOM, Angry Birds Magic product manager Ramine Darabiha said that Rovio's intention is not to have Magic NFC tags in every possible location but rather to place them selectively so as to "enhance the gameplay for users." In other words, don't expect to see Angry Birds fans running around and bumping their phones against trees in your woodsy backyard. Overall, Magic sounds quite promising - it's a beacon of refreshingly unfamiliar light on an otherwise well-trodden path. Put less eloquently, we can't wait.